Earth formed 4.54 billion years ago. But we've never found any rocks remaining from the time when our planet formed. Until now. A piece of ancient mantle is revealing Earth's oldest secrets. The mantle is the rocky, solid layer between the Earth's crust and its outer core. It's by far the biggest part of the Earth, accounting for a whopping 84% of its volume. The mantle isn't a uniform layer- it's got countless pockets and reservoirs, each with their own unique chemical composition and each dating back to a different period in Earth's ancient history. Geologists have hypothesized that primordial Earth (along with the other planets) shared the same basic chemistry as chondrites, which are the oldest and most common meteors in the solar system. There are many different varieties of chrondites, but they all have chemical compositions that closely resemble that of the Sun. This has all given rise to the so-called chondritic model, which predicts that a sufficiently ancient piece of the Earth's mantle should have a Sunlike ratio of helium, lead, and neodymium isotopes. However, there are two problems with this. First, we hadn't been able to find an old enough piece of the mantle to test the theory. Second, researchers determined a few years ago that the overall ratio of neodymium isotopes on Earth was too high to support a chondritic model. That meant geologists had to recalculate the initial chemical composition of our planet as it formed. Of course, adjusting the numbers to solve the second problem provided a new opportunity to tackle the first. Geologists had been searching for remnants of the ancient mantle in locations that had neodymium levels that fit with the old model, not the new one. 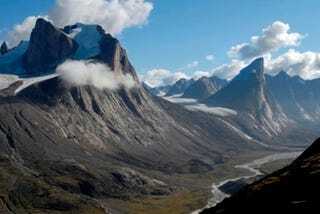 They had been looking under the wrong rocks all along, and the recalculated chemical composition took a team of researchers above the Arctic Circle to Canada's remote Baffin Island, and they soon found just the rock they were looking for. Well, technically, it wasn't a rock - the original rock had melted about 62 million years ago when it came into contact with magma, which was then ejected from the mantle onto the island surface in a burst of volcanic activity. Fortunately, when magma melts rock, it takes on the same isotopic composition, so preserved lava is a perfect proxy for the original rock. So what does this tell us about the formation of Earth? First, this discovery supports the argument that the Earth's neodymium ratios are too high to support the chondritic model. So what's the alternative? Research leader Matthew Jackson suggests the ancient Earth might have gone through a traumatic geological event where its entire crust was extracted and buried deep underground. The ratios found in the original crust and the piece of the mantle recovered on Baffin Island would then add up to the traditional chondritic model. It's a possibility, although it could be hard to find empirical data to prove or disprove that idea.